Click image to register on Eventbrite. Sounds a bit like e-patient thinking, yes? So fifty years ago – May 9, 1969 – Miriam and a bunch of other uppity women got together at Emmanuel College in Boston, for an event that led to real change. I had the thrill this winter of connecting with Miriam. 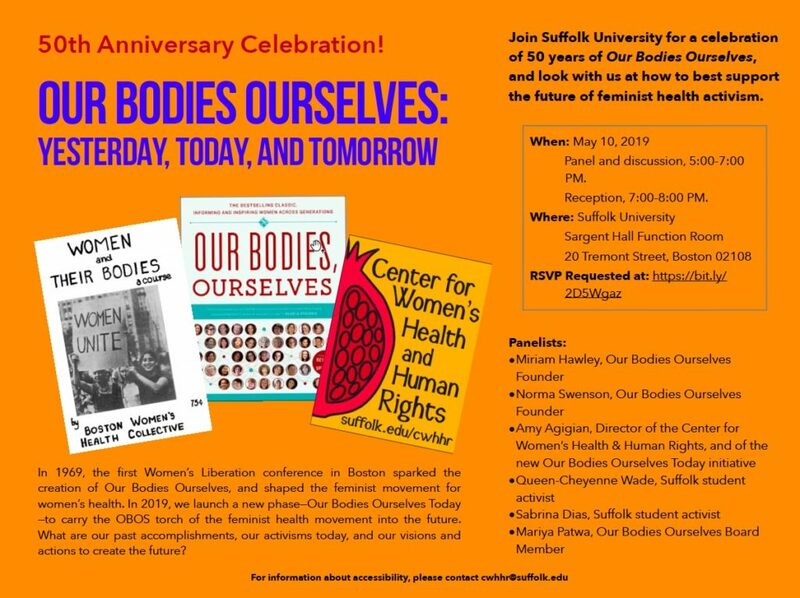 And this year, on Friday evening, May 10, a 50th anniversary celebration will take place at Suffolk University in Boston. In 2019 we launch a new phase – Our Bodies Ourselves Today – to carry the OBOS torch of the feminist health movement into the future. “OBOST” will live at Suffolk’s Center for Women’s Health and Human Rights, which is why the event will be there. Registration (free) is open now. I’ll be there – I hope you’ll register and attend, too. What they stood for then – and stand for today – has much in common with the culture change we’re working on in medicine. After all: in all of healthcare, it is about our bodies, ourselves. Come honor these pioneers. * Uterine trouble from higher ed?? Seems to me that men have more trouble mixing college and their reproductive systems … and I say that having been one. Thanks Dave for the heads up about this post, and especially about Suffolk U’s 50th Anniversary celebration of OBOS! This book, and the Boston Women’s Health Collective, and the organizations inspired to embrace this revolutionary philosophy were profoundly important to me in my 20s. It was a heady time in those early days, when so many women honestly began to believe we could impact societal changes. I know this event will be fantastic – enjoy it!